E186 Aust Folio 1 Part of the hunters River, 1816 (High Street, (Watt St) Lighthouse (Beacon) also three mine entrances to the south of Flagstaff Hill shown) Ship wreck Dundee lost 1812, Commandants Farm at Cottage Creek .Coal Yards and two lead lights shown at Watt St Wharf. Survey is by Lieutenant Jefferies commander of the Brig Kangaroo, March 1816. Scale is marked 1/2 “to the mile and an Insert of an Eye sketch of Crooks Haven Jervis Bay is included. 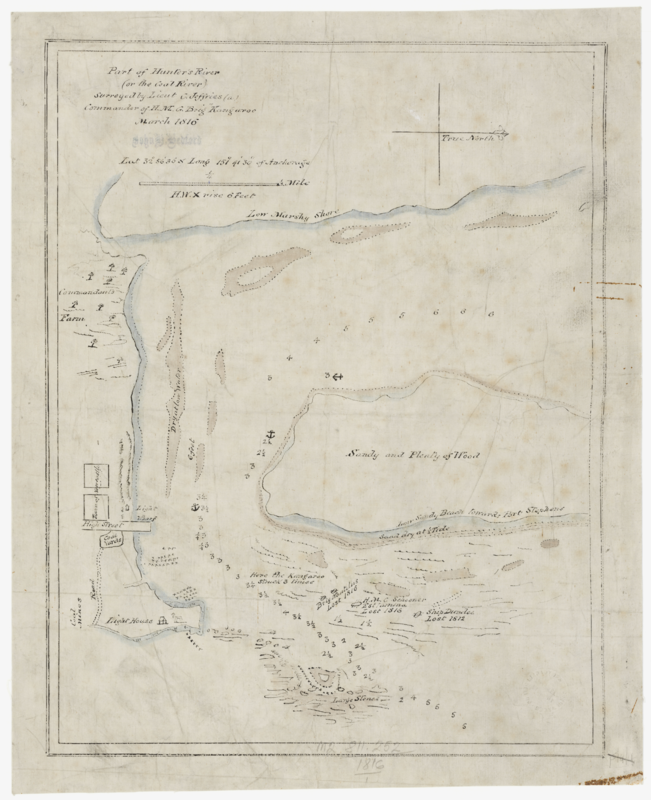 Part of Hunter’s River [cartographic material] : (or the Coal River) / surveyed by Lieut C. Jeffries (a) Commander of H. M. G. Brig. Kangaroo. 1 ms. map : col., tracing ; 33 x 25 cm, on sheet 37 x 30 cm. Relief shown pictorially and soundings. Shows channels, navigational hazards, town high street, coal yards, light house commandants farm and sites of wrecks: Brig Nautilus lost 1816, H.M.C. Schooner Est [a]nina lost 1816, Ship Dundee lost 1812. Tracing of original manuscript map. Online images available via the State Library of NSW at: http://acms.sl.nsw.gov.au/album/albumView.aspx?itemID=1255750&acmsid=0 ; Digital order number c02507. Mitchell Library copy: Mounted on linen.